This Sunday’s Gospel ends with Jesus saying to Peter “Do not be afraid; from now on it is men you will catch”. Subsequently Peter, but also Andrew, James and John left everything and followed our Lord. But why did these ordinary fishermen suddenly leave everything behind and follow this man Jesus? The beginning of the Gospel narrates that they are working away washing their nets and don’t even seem to be part of the crowd pressing around Jesus. But why? One thing which can be noted in beginning of this passage from the Gospel is that the man which we know by the name of Peter is called Simon. However, after the encounter with Jesus we suddenly see that it is not just Simon anymore, but Simon Peter. 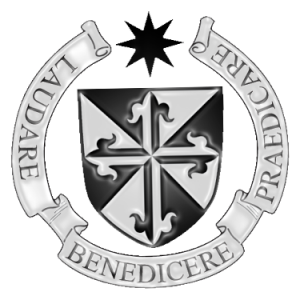 Peter, as will be explained elsewhere, means ‘rock’ and it is on this rock that the Church is build. The reason for this change from an ordinary fisherman to the future leader of the Church lies in the fact that God loves us all and touches us all in a personal way. He touches us in a way that cuts to the heart, giving us the grace to get to know Him, to start a relationship with Him and to become His friend. In accepting this grace it can be noted that there is not a transition from Simon to Peter, but that it is now Simon Peter. The Lord does not take away from us, or changes us, but makes us complete and brings us to our full potential. This is what leads us to true happiness, it makes us feel whole and it brings us peace. If we accept the offer of God’s friendship then it makes sense to leave everything else behind. But interestingly a little later Peter draws back from the Lord when he says “Leave me Lord; I am a sinful man”. By distancing ourselves from Jesus we reject the gift that is given to us, and so the completeness that is offered. As a result Simon Peter loses the addition of Peter to his name. But this was Peter’s own doing, and God is always calling us even if we draw back. 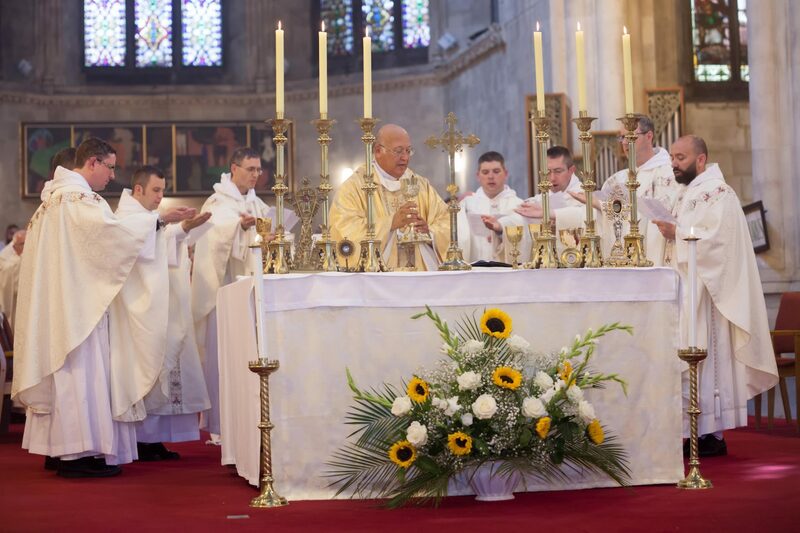 At the subsequent summons of Jesus, Simon Peter leaves everything and follows the Lord. All is grace, and maybe we don’t realise enough how much grace is actually given to us. God shines out even in the midst of our weakness, as we can see in the example of Peter. But this is why we are called to trust in God, like Peter does despite the fact he feels so inadequate. Knowing God does make a real difference in our lives. It makes a difference when we have God near, but it in the same way makes it a difference when we turn ourselves away from Him. But God is always there, always waiting for us to turn back. It is only in turning back to Him that we can really feel complete and live life to the full. One day as Jesus was standing by the Lake of Gennesaret, the people were crowding around him and listening to the word of God. He saw at the water’s edge two boats, left there by the fishermen, who were washing their nets. He got into one of the boats, the one belonging to Simon, and asked him to put out a little from shore. 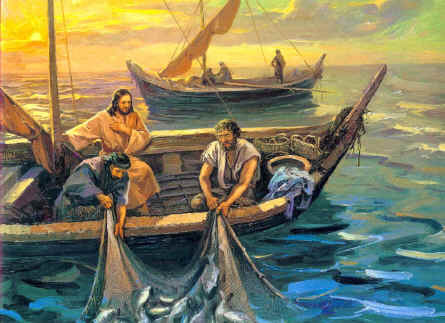 Then he sat down and taught the people from the boat.When he had finished speaking, he said to Simon, “Put out into deep water, and let down the nets for a catch.” Simon answered, “Master, we’ve worked hard all night and haven’t caught anything. But because you say so, I will let down the nets.” When they had done so, they caught such a large number of fish that their nets began to break. So they signaled their partners in the other boat to come and help them, and they came and filled both boats so full that they began to sink. When Simon Peter saw this, he fell at Jesus’ knees and said, “Go away from me, Lord; I am a sinful man!” For he and all his companions were astonished at the catch of fish they had taken, and so were James and John, the sons of Zebedee, Simon’s partners. Then Jesus said to Simon, “Don’t be afraid; from now on you will fish for people.” So they pulled their boats up on shore, left everything and followed him.